DUBLIN CITY COUNCIL will provide free sanitary products in all DCC buildings including community centres, swimming pools and libraries. The move, proposed by Labour’s Rebecca Moynihan, was backed by councillors at a meeting today. Speaking after the meeting, Moynihan said, in passing the motion, DCC has accepted it has “a responsibility to break down the stigma around periods and tackling period poverty”. 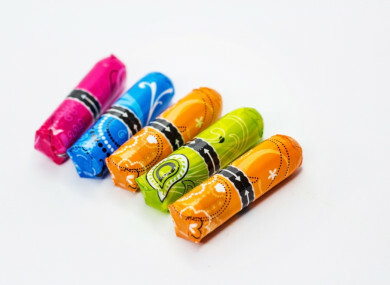 She said period poverty is “a very real problem issue for women in low-income households” – something highlighted in a recent survey by Plan International Ireland, which found that half of Irish girls aged 12-19 have experienced issues around the affordability of sanitary products. The logistics and financial aspect of the plan have yet to be ironed out. Moynihan said low-income families “shouldn’t have the additional burden of struggling to afford sanitary products; homeless women should not have to be suffering on the streets; or young girls should not be missing school once a month because they just can’t afford sanitary protection”. She noted that, despite being essential, sanitary products are often priced as if they are “luxury goods”. Moynihan said she hoped the government would follow Scotland’s lead and take action in the upcoming Budget to provide free sanitary products in all schools and colleges. Email “Free sanitary products to be provided in DCC community centres and libraries”. Feedback on “Free sanitary products to be provided in DCC community centres and libraries”.